It’s no one’s fault but my own, I made the decision to work late, AGAIN! I’m exhausted and irritated that my teen does not want to order pizza. She has informed me of the number of times we’ve ordered out this week. Acting like a junkie, I frantically jerk opened a bottle of 2007 Campo Veijo Rioja Tempranillo and throw together some spaghetti for dinner. Continuing my junkie-like behavior, I admire the bottle of wine with thoughts of: “I know I shouldn’t be drinking you now”; “I probably won’t appreciate you”; and “Regardless of my sour feelings, you will be drank.” The last Tempranillo required an hour to breathe; therefore, my expectations are not high. Spazzing time over, I decide to allow the wine to breathe; Campo Viejo (viejo meaning “old” in Spanish) doesn’t deserve this kind of disrespect ;). How old are these Tempranillo vines? I guess I’m too old to access Campo Viejo’s website; the site doesn’t recognize my date of birth. We’ll just assume the vines are “old”. I’m finally beginning to relax, listening to audible.com, which is my recent obsession and eyeing the Campo Viejo. Like many mothers (and dads :)), being a great multi-tasker, I’m writing, cooking, listening and soon to be sipping. The words “THANK YOU, MOM!” were just yelled from downstairs. Whenever I put little effort into my spaghetti, the girls love it! Crisis over! We have light and the sipping has resumed (what am I trying to prove, the sipping never stopped :)). 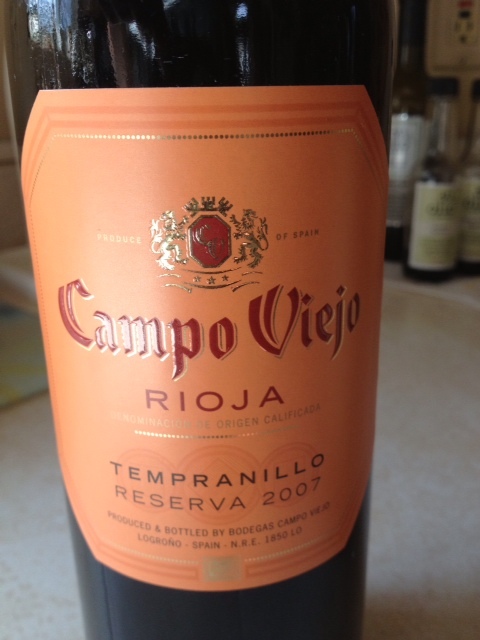 Campo is a good medium-full bodied red wine with a long smooth finish. Campo Viejo by candlelit was the perfect ending to a stressful day. If Cabernet(s) and Bordeaux are too big, too heavy, and too tannic try something new; you won’t be disappointed with a Spanish Rioja. Food pairing: Beef, lamb, roasted meats, strong cheeses and my spaghetti.